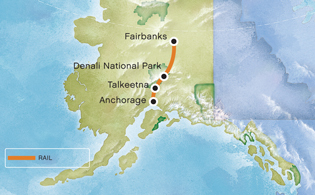 Travel from the Golden Heart city of Fairbanks to the famed Denali National Park and Preserve. Spend an ample amount of time in the Denali area before making the trip to the town of Talkeetna and the Mt. McKinley Princess Wilderness Lodge. Explore this unique area by taking one of several optional activities like flightseeing or river rafting. End your time in Alaska by traveling via luxury rail to Alaska's largest city, Anchorage. We'll pick you up at the airport and transfer you to your Fairbanks hotel. Overnight in Alaska’s second largest city and enjoy its gold rush history and frontier flair. We offer many optional tours like Chena Hot Springs & Ice Museum or dinner and a show at the Alaska Salmon Bake. Overnight Fairbanks hotel. You'll continue your journey to Talkeetna aboard our luxury domed railcars. You’ll stay at the beautiful Mt. McKinley Princess Wilderness Lodge, featuring quite possibly the most awesome view of the "Great One" in the state. Once there, you’ll have time for optional activities such as flightseeing and river tours. Overnight Mt. McKinley Princess Wilderness Lodge. Enjoy a morning at leisure or spend your morning on an optional activity like a guided hike or jet boat safari. Later, re-board our glass domed railcars and begin the journey to Anchorage. Upon arrival in Anchorage, transfer to your hotel. Overnight Anchorage hotel. We will take you to the airport to finish out your Alaska vacation.